New year, new me. Isn’t that how the age-old phrase goes? It’s been a long-standing tradition for people all around the world to use January 1 as the day to begin improvements to their lives and overall well-being. Whether it’s kicking a bad habit or introducing a new one, the path to wellness is different and personal for everyone. For that reason, we’ve picked the first of the year to introduce our brand-new Live Well campaign. We believe that no matter what positive changes a person tries to make in their life, it all begins with living well at home. Having a positive, healthy home life has a way of naturally extending to the outside world. And we believe our Live Well program will help our residents get started down that road, no matter what it is they are looking to achieve. We kicked off our campaign earlier this month with a Facebook contest that led to one lucky resident scoring a Fitbit wristband. But that was just the beginning. We also introduced a new series of yoga classes for our residents. These Zen-inspired workout sessions are hosted every Monday and Wednesday evening at the MetroFit basketball court. Later this month, residents will be treated to a Rise & Shine breakfast event where we’ll offer an array of healthy food options aimed to start the day the right way. Throughout the year, we’ll introduce even more events that will encourage our residents to make (or keep up with) the commitment to better their lives. In February, we’ll offer a series of chair massage events—champagne included! They’ll be a great reminder that self-care is good for the body, mind, and soul. And in March, we’ll celebrate St. Paddy’s Day with a twist as we host a series of “Get Your Green On” events at our communities. There’s so much more we’re planning, and we hope our residents will enjoy all that our Live Well campaign has to offer. We look forward to playing even the smallest role in helping them be the best version of themselves in 2019. Happy New Year to all! 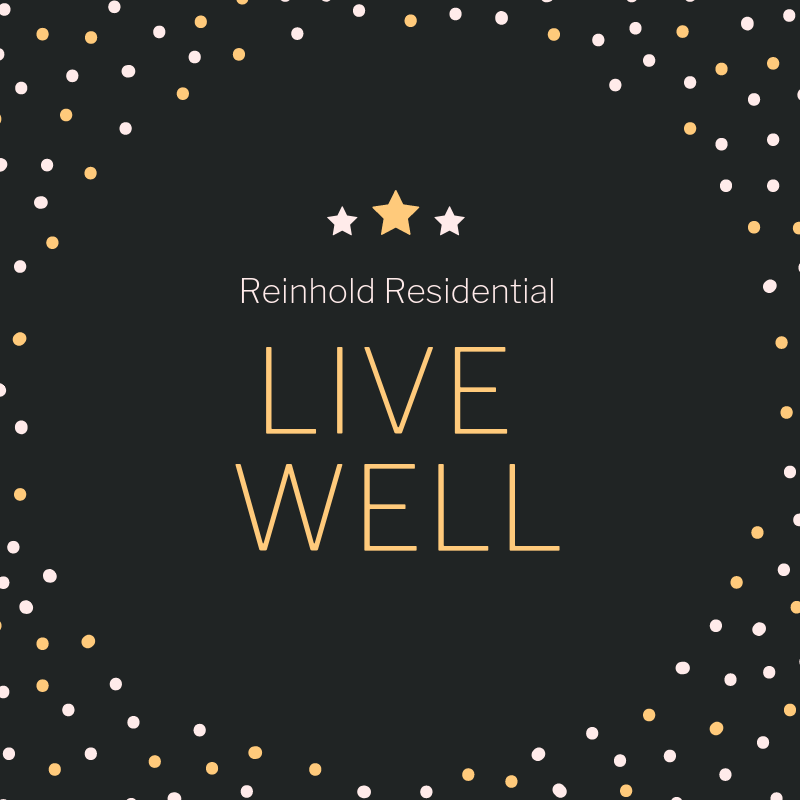 Contact Reinhold Residential to learn more about future events and our Live Well campaign!